One of the fans’ central accusations (from information in the bond prospectus) is that the vast majority of the proceeds United received from selling Cristiano Ronaldo to Real Madrid were going to be used to repay a chunk of the Glazer family’s toxic “Payment In Kind” (“PIK”) loans. A research report published in the last few days shows this payment is the central assumption of no less than the Glazers’ own bankers, JP Morgan. “We have £100m in the bank” says David Gill. “It is available to the manager”. People like me say that the bond prospectus is very clear that £70m will soon be sucked out of the club to pay the Glazers’ own debts (I strongly believe this take place after 31 March so it doesn’t appear in the accounts until August). David Gill says the PIKs "are not the responsibility of Manchester United". Our club has received an incredible windfall from the Ronaldo sale. At a time when its core working class support is being priced out of going to the match by greedy owners and a recession, that’s the sort of thing a football club would do…..
Tell your mates, tell your family, tell everyone. The Glazers are going to take the Ronnie money and you didn’t hear it from some mad bloke on the net, Manchester United’s bankers said so. [i] Total 2008/9 ticket revenue (30 home game season) £90.2m (source: Bond Prospectus). My analysis (available on request) shows 21% of this is derived from non-exec tickets in the Stretford End (West Stand), Scoreboard End (East Stand ) and North Stand Tier 3. These areas therefore contribute £18.9m per annum. A 20% cut would cost c. £4m per annum, and £40m could guarantee these lower prices (increasing only by inflation thereafter) for ten years. Alternatively a 10% cut could be guaranteed for 20 years. A freeze in season ticket prices! Wow! After five years when the average season ticket price has risen 51% (or 37% above the rate of inflation)! I think we can safely conclude from this “news” that a) the Glazers are terrified of the green and gold movement and a possible boycott of season tickets and b) that they are so desperate to get their hands on United’s cash that despite their fear they can’t countenance any more “generous” price move (such as the cuts in season ticket prices for next season seen at the Bucs). On to more important things, like analysing Joel Glazer’s qualifications (sic) for running our club. A big thank you to Ian Patterson, Jacopo Belbo and “DW” for between them providing some very high quality evidence about Joel’s time at The American University in the late 1980s. Sadly I’m going to have award each of them a t-shirt for their efforts (I'll be in touch gentlemen), but this blog is all about being fair and honest. For those of you (like me until I looked it up) not well versed in US “grade-point averages”, an admission requirement of 2.00 is a “C” grade (the American University has now raised this requirement to 2.50 for students wanting to do the course today). “CLEG” is as Jacopo Belbo rightly said, “…a little of this, a little of that, ease by major.” As you can see it includes such rigorous academic subjects as “Public Speaking” (not something he has had much call upon since the family bought United) and “Civil Rights and Liberties” (I doubt “Can you seize a banner from peaceful protesters inside a football ground?” was covered). I'd use the very American phrase "Mickey Mouse" to describe the degree myself. So we can now safely strike off “genius” from the list of possible reasons to want this man to chair our club, having already dismissed “successful business man” (see First Allied Corporation), “track record running a sporting organisation” (see these comments from Buc’s fans post Joel’s latest interview), “philanthropist” (see ticket prices, management fees, consultancy fee, personal loans and dividends) and “United fan” (ha bloody ha). Of course he’s only “a phone call away” if David Gill needs a decision on something so that’s OK.
Competition time - grass up Joel and win a t-shirt! Apologies for the lack of recent posts. I've been busy doing some more digging into the Glazers’ US property business (digging which is making me revise up sharply my estimate of how indebted the business is). Whilst that continues, I thought I’d organise a competition, WITH A PRIZE, which will hopefully improve our knowledge of the Glazers. Credit and thanks goes to “Patrick O” for emailing in this interesting question about the degree qualification of United's esteemed co-Chairman Joel Glazer. According to the Tampa Bay Buccaneers website, both Joel and fellow co-Chairman Avram (and various other Glazer siblings) went to American University in Washington DC. American University is a mid-tier (no. 433 in Forbe’s top 600 colleges list 2009) private university founded by Methodists. Not a very high powered institution for a family that has spawned so many successful business executives.... We know Avram got a law degree, but Joel’s exact degree qualification is unclear. All the Bucs site says is that Joel “earned his bachelor’s degree in interdisciplinary studies from American University in 1989”. The college’s website shows the following current undergraduate interdisciplinary studies (although obviously things could have been different in the late 1980s). None of these degrees leap out as preparing the young Joel for a career exploiting people sports management so I am very curious as to what he studied. Given his (somewhat foolish) promise to communicate with supporters during what turned out to be his only ever interview about the Glazers’ ownership of United, I assume it wasn’t Foreign Language and Communications Media, but you never know. So here’s the challenge, if someone can tell me definitively what Joel studied at American University (and provide some proof), they’ll win this very attractive Newton Heath 1878 t-shirt from T-Shirts United. Available in a range of colours (including green and gold of course) and in all conceivable sizes (and I’ll even throw in worldwide shipping). More soon on shopping centers and debt. Bond price update - investors making a profit! The chart below shows the bond price from its first day of trading on 25th January to its closing price yesterday. I have added a line showing the issue price of the sterling bonds (98.089) and a line showing the closing price on 1st March 2010 (the day before the "Red Knights" announced that they were looking at putting together an offer for United). The announcement came on the same day as United announced results for the three months to 31 December 2009. The first thing to say is that having been the worse performing "high yield" bond issue of 2010, the MU Finance plc bonds are now trading above their issue price. Investors are now showing a profit on their original investment (the same is true for the US$ bonds but I will stick to the sterling issue for ease). Furthermore, this turnaround is emphatically not related to a rise in bonds generally, the "spread" on United's bonds has fallen to a post issue low of 578 basis points (i.e. a yield 5.78% above gilts). The price move is United specific. You can see from the chart that the bonds started trading well below the issue price. I argued at the time (as did other less biased commentators) that the bonds had been mis-priced and that the issue price did not reflect the inherent risks of the Glazers' business model, something I stand by. As the chart shows, by late February, the price had stabilised and as I wrote at the time, the huge fall in mid-February looked excessive. The interesting movement in the bond price has happened in March of course. Sky News fisrt reported the existence of the Red Knights on the evening of 1st March, after the markets had closed. The next morning the price rose from 93.75 to 95.00 with all this move occurring prior to United publishing its quarterly results that day. If United is sold (or if other events mean the Glazer family lose control of the club), the bonds have to be redeemed at 101% of their face value. This makes a probability of there being an offer for United a key influence on the bond price. There is of course no way of knowing why the price has risen so sharply in March. It is possible that all of the appreciation is due to the bond market reappraising the club as a business. For me, there was nothing of note in the Q4 2009 results statement. Since then the club has announced three new sponsorship deals with Telekom Malaysia, Turkish Airlines (despite one senior manager from the airline being photographed wearing a green and gold scarf at a recent home game, if you don't believe me I know someone who has a photo) and most recently South Africa's MTN. These sponsorship deals are all "nice to haves" for the club, but I doubt they generate more than £1m each per annum in profit. Half of this extra profit has been wiped out in higher interest costs from the $ bonds. The club has partially hedged the February 2011 coupon payment (at a cost of course), but the August 2010 and all other future payments are currently unhedged. The annual $ coupon payment is fixed at $35.6m. At the time of the bond issue, sterling was trading at $1.61. As I write it is $1.515. This has the effect of increasing the sterling cost of the $35.6m from £22.1m (at the time of the bond issue) to £23.5m today. All that hard work from United's commercial department and most of it is needed just to stand still as the currency falls...... On the pitch of course things have been going very well, but this has little impact on United's long-term ability to pay its debts. So I don't see what could have radically changed the bond market's view of United's bonds since the start of the month, except of course an increasing belief that the club will be sold and that the bondholders will get their payout at 101%. As I said above, such a supposition cannot be proved, but the bond price move should make those who see a successful bid for United as pie in the sky at least pause for thought. Question 1: Which of the following events is MOST LIKELY to happen? Question 2: Which of the following events was NOT identified as a “Risk Factor” in MU Finance plc’s bond prospectus? I think the answer to both is c). If a US court is asked the same questions and agrees with me, then things could potentially get very expensive for the Glazer family. There are no less than fifteen pages of “Risk Factors” in the MU Finance bond prospectus. Such is the norm with modern debt and equity issues in our (and particularly America’s) litigious culture. The Risk Factors cover a huge range of potential pitfalls from player injuries, through the nature of English insolvency law to the terrorist attacks I mentioned above. The purpose of the Risk Factor segment is both to alert potential bond holders to things than could go wrong, but also (and perhaps more importantly) to protect the issuer of the bonds (MU Finance plc and its parent company Red Football Ltd) from any potential litigation from bond holders in the event of something going materially wrong at United. The reason that the list is so long (other than the fact that football is inherently a risky business) is that if any substantial risks are not disclosed and then come to pass, the issuer can be sued by people who bought the bonds. In US courts, not only can investors sue for the amount invested, but also for punitive damages in cases where business risks were not adequately disclosed. Such punitive damages can be several multiples of the original amount invested. So the prospectus attempts to list all material risks Red Football is aware of but doesn’t mention supporter opposition to the club’s ownership. This raises the question whether the risk of action by supporters was considered “immaterial” and was therefore deliberately not mentioned, or whether Red Football’s management aware of it. Opposition to the Glazers runs deep and is long standing. Years of ticket price rises, the lack of transfer activity last summer and news that total debt had passed the £700m mark had already increased supporters’ concerns by the end of 2009. The publication of the prospectus itself was always going to anger supporters as it revealed for the first time all the cash extracted from the club by the Glazers and their intention to take much, much more in the future. I am not suggesting that the famous Chatmaster’s “green and gold” idea should have been foreseeable, nor the formation of the Red Knights group, merely that when a sizeable proportion of your customer base is already very unhappy about the way things are, when you know you are about to reveal further the gory details and when you are failing to sell out the ground on a growing number of occasions, then a “customer” backlash is a material risk. A red I know is friends with a (football ignorant) bond manager who had bought bonds in the issue. When the red asked him if he was worried about a boycott, the bond manager was startled and asked him what he was talking about. When he heard the answer he didn’t like it. As the saying goes, I’m no lawyer, but I have seen hundreds of securities offering documents over the years and have a fair idea what constitutes a material risk and what doesn’t for United’s “business, financial condition or results of operations”. If I was a bondholder and in the next few months supporters’ groups call a boycott with a significant number of season ticket and executive ticket holders taking part, I’d have a lot of questions to ask about why the risk of such an event was not disclosed. Why even the existence of opposition to the owners was not disclosed. But before I asked those questions I’d call my lawyers and I’d make sure they were in America. “We are ownership neutral” – Is this Liverpool’s 2005 moment? Warning: this post gives sympathetic coverage of Liverpool Football Club’s problems with owners and debt, if you wouldn’t piss on a scouser if he was on fire, please navigate away from this page. The quote in the title of this post is something repeated several times (with some perverse pride) by Dan Johnson, the Premier League Head of Communications at the BBC’s “Football in the Red” debate in Manchester two weeks ago. His statement was met with derision by the audience because it summed up the football authorities’ blasé approach to one of the key problems in the national sport. I may have lost my temper with him and accused him of ludicrous complacency. I do have some sympathy for Dan (who I can only imagine was desperate for a challenge when he accepted the role), after all the man has to clean up after Richard “£866,000 and no clouds in the sky” Scudamore. Dan tried to fob the BBC audience off with the Premier League’s souped up “Fit and Proper Person Test” and the laughable new “early warning system” (relying on auditors to spot problems, just like they did so brilliantly at Enron, Lehman Brothers or Portsmouth FC). The Premier League can tinker with processes and procedures, but the overall philosophy hasn’t changed, if it’s legal the Premier League are in favour of it, if Pompey have four owners in 12 months, that’s fine. This weekend, news has emerged that a private equity firm, Rhone Group has offered to invest £110-120m (reports differ) in Liverpool FC in exchange for a 40% stake. The club’s current owners, Hicks and Gillett would have to accept this 40% dilution, but with the deadline for their Kop Football (Holdings) Ltd acquisition vehicle to reduce its debt rapidly approaching, not accepting such an offer could lead to the owners forfeiting their shares in the club. The financial structure at Liverpool is not dissimilar to that at United, with over-stretched owners desperate to solve a debt crisis that was entirely of their own making. Neither club has gained anything from the leveraged buyouts that were used to acquire them. In United’s case, the main consequence has been the pricing out of traditional supporters, whilst at Liverpool Hicks and Gillett’s stewardship has further delayed the building of a new stadium that everyone agrees is needed. Although (according to figures from http://www.transferleague.co.uk/) Benitez’s net transfer spending since he took over at Liverpool is actually £1m higher than Sir Alex Ferguson’s over the same period (and that is ignoring the proceeds from the sale of Ronaldo destined for the PIKs), the amount of revenue generated from matches at Anfield is far too small vs. other comparable clubs. Hicks and Gillett haven’t produced accounts for last season yet, but looking at the 2007/08 numbers, Liverpool only generated revenue of £1.3m per home game vs. £2.3m at Chelsea (who have other sources of cash of course) and more than £3m per game at Old Trafford and the Emirates (these other clubs’ figures are for 2008/09). The reporting in the weekend papers suggests that Rhone Group would pay down Kop Football (Holdings) Ltd’s debt with its equity injection. This would greatly improve the chances of raising capital for a new ground. So far, so altruistic (“Scouse Knights” perhaps?). But of course the arrival of a business like Rhone Group on the scene marks a new, sad twist in the pawning of the English game. The Glazers made a half-hearted and wholly unconvincing attempt to paint themselves (or at least Joel) as United fans. Hicks and Gillett launched their takeover talking of their intention to be “custodians” of the club which they would hold as a “family asset”. Whilst many Liverpool supporters had been hoping Dubai International Capital would acquire the club, the acquisition by Hicks and Gillett was initially generally viewed positively by fans and it took eleven months before organised supporter opposition began in earnest. Rhone Group will not of course claim to be staffed entirely by Liverpool supporters, they are transparently in it for the money. For many Liverpool supporters, the temptation may well be to welcome any new owners, especially one who could pay down almost half the club and parent company’s debts. I think welcoming such attention would be a terrible mistake, private equity firms can’t spell altruism let alone practice it. Look again at the table of matchday income above again. Liverpool bring in around £30 per occupied seat per game. The two London clubs bring in more than £50. United is now far closer to Arsenal than its traditional north western rivals. In 2004/05, the last year of the plc, the equivalent number for United was £33, revenue per seat has risen 45% since the takeover, a small amount of the change is “mix” (relatively more corporate facilities when the quadrants opened) but the vast majority of the change is from higher ticket prices. Rhone Group (and no doubt other similar organisations) see the opportunity to get into Liverpool at an enterprise value of just over £400m. They no doubt see a famous club with a global brand, charging ticket prices 30% below those at United. They see desperate current owners. They smell a money making opportunity. For the Premier League, a deal along the lines Rhone Group are proposing will no doubt be seen as a triumph. At least £100m can be knocked off the Premier League’s debt total, a shiny new stadium may well appear, the appeal of the league to global capital will be confirmed. Best. League. In. The. World. Fact. Of course next weekend we play Liverpool at Old Trafford, just over 100 years after we first played them there. I understand how controversial the idea is of United and Liverpool supporters coming together in some way to protest at what has been done to our clubs, but I’d ask people to think who the real enemy are before dismissing all such ideas out of hand. First Allied Corporation - even worse than I suspected? A strip center in the Crosswoods complex in north Columbus has gone into foreclosure. Charlotte, N.C.-based Bank of America Corp. on Thursday filed to foreclose on the 20,000-square-foot center at 110-158 Hutchinson Ave. Next to the Marcus Corp. movie theater at Crosswoods, the strip is home to a mix of restaurants. Bank of America filed the suit in U.S. District Court in Columbus against Crosswoods Commons Shopping Center Columbus Ohio LP, a partnership that includes Rochester, N.Y.-based First Allied Corp. According to First Allied’s Web site, the real estate firm owns and leases more than 6.7 million square feet of retail space in 20 states. The Crosswoods center was First Allied’s first acquisition in Ohio, and the company said it considered it a good deal because it included tenants such as BW-3, Chipotle, Stauf’s Coffee and Panera Bread. Today, the center is occupied by Jed’s BBQ & Brew, SushiKo, Lotus Grill and Chipotle. Two spots in the center are empty. Alan Bobrowski, First Allied’s general manager, declined to comment on the foreclosure." Running on empty, how bad are things in the Glazer empire? Isn’t it strange that the “billionaire” Glazer family have never paid down a penny of the spiralling Payment In Kind (“PIK”) loans that David Gill tells us are the “family’s responsibility”? Even if the successfully concluded bond issue now allows the PIKs to be repaid from Manchester United’s cash flow, it would still make financial sense to pay them down themselves and then pocket United’s dividends. A loan that is increasing by a compound rate of 14.25% pa (soon to rise to 16.25%) is some of the most expensive financing imaginable. You would always pay it down if you could. What could be going on inside the Glazer empire that has prevented them from doing so? Now I don’t intend to embarrass myself by commentating on NFL matters, a subject about which I know virtually nothing, but a quick trawl through the US media and various fans’ sites suggest that despite an appalling 2009 season (winning 3 and losing 13, the worse season for the Bucs since 1991), the Glazers are in no mood to spend money on their team. It is often suggested that the Buccaneers were operating $30m below the salary cap last season (an NFL record) and there has so far been little activity during the “free agent” process that started a few days ago. Inevitably, Bucs fans and the local media have questioned whether all is well with owners financially. Attendances were down over 10% last season and season ticket prices have been cut aggressively (we wish). It is worth remembering that the Glazers’ purchase of United was met with some surprise in Florida. Whilst rich, the family did not appear to have the sort of means required to finance such a large purchase. Indeed, even the publically declared equity element (£272m or $495m at the time) was so large that one local paper (the St Petersburg Times) suggested the family would need to make asset sales to raise the money. During the run up to the family’s bid for United, there were very strong market rumours that at least some of the £272m “equity” had itself been borrowed. I have it on very good authority that Commerzbank lent the family £100m+ to buy United shares on the market. Whatever the truth of the matter, such loans were definitely repaid immediately before the bid, because otherwise the family would not have been able to issue the original “prefs” (the precursors to the PIKs) secured on their equity in the club. It is my strong suspicion (although I should stress it is speculation) that the family’s property business, First Allied Corporation, repaid the Commerzbank loan using debt raised against its US property interests. First Allied was a party to the pref agreements with the three original hedge funds, suggesting it was involved in the initial financing of the bid. Sadly for curious observers like me, there is very little public information on the “intensely private” Glazer family. Their ownership of United and the Tampa Bay Buccaneers couldn’t be more high profile of course, but any other details of their business affairs remain very hard to find. The 2005 Offer Document and the 2006 Refinancing Investment Memorandum both name two major business owned by the family in addition to United and the Buccaneers, these were Zapata Corporation (listed on the New York Stock Exchange) and First Allied Corporation (their private US real estate business). The Glazers took a majority stake in Zapata in 1992 (the business had been founded by George H Bush in 1966 as an oil drilling contractor). The Glazers used Zapata as a vehicle for various ventures in the 1990s, including abortive attempts to become a dotcom business during the internet boom (Zapata launched an unsuccessful hostile bid for excite.com). By the time of the acquisition of United, Zapata’s main investments were a 77.5% stake in air bag fabric manufacturer Safety Components International and a 58.1% stake in Omega Protein Corporation, a business producing fish oil and fish meal from the Menhaden fish found off the eastern seaboard of the United States. Having attempted to take full control of Safety Components in 2003 and 2004, Zapata sold its stake in the business in September 2005 to private equity investor Wilbur Ross for $51.2m. The disposal of the stake in Safety Components was followed swiftly by an exit from Omega Protein Corporation, in a series of transactions in 2006. At this point, it appeared that Zapata intended to reinvest its c. $160m cash pile in other businesses. The credit crunch seems to have put pay to this plan, and in June 2009, SEC fillings showed that the Glazers had sold their 51% stake in Zapata (which was by this stage effectively a cash shell) to veteran investor Philip Falcone for $74m (£46m). Zapata Corporation wasn’t the only asset the Glazer family cashed in during 2009. In 2000, one of the Glazers’ companies, First Allied Jacksonville Corporation paid $14m for the historic Palm beach mansion La Bellucia (“Beautiful Lucy”) designed by Addison Mizner and built in 1920 (see photo). Despite its historic status, the Glazer family initially sought planning permission to demolish the property (such respecters of tradition). When this was turned down, a refurbishment was apparently planned, but then in late 2009, the property suddenly went on the market for $27.5m and was sold swiftly to Jeff Greene (a man who made a fortune betting the against sub-prime mortgages) for a very reasonable $24m. So within six months, the Glazers raised almost a $100m (before tax). We know they didn’t use any of the proceeds to pay down the PIKs, and indeed we also know that in December 2008, the Glazers felt it necessary to borrow £10m ($16m) from Manchester United. These loans were on top of £10m paid since the takeover in “management and administration fees”, and a £2.9m “consultancy agreement” between United and a Glazer company signed in June 2009. The sudden rush for cash by the Glazers in 2009 suggests that things were not going well at the heart of the family business, First Allied Corporation. Unlike in the UK, a private US company like First Allied does not have to file any public accounts. Sadly, there is no US equivalent of Companies House. The company’s website does however allow us to look at what assets it owns. The company say it “specializes in the ownership, management and leasing of over 6,700,000 square feet of community and neighborhood shopping centers located throughout the United States.” This 6.7m sq ft doesn’t tally with the list of properties on the company’s website (perhaps there have been disposals), the properties listed total, by my calculation, 5.27m square feet. This makes First Allied a medium sized player in the shopping center market in the US. Thankfully, most of First Allied’s peers are quoted companies and this allows us to draw some tentative conclusions about the state of the business. Looking at the company’s quoted peer group of shopping center Real Estate Investment Trusts (“REITs”), we can see that on average, rent per square foot is $12-13 for shopping centers. So assuming a rental value of $13 per square foot (including vacant lots), this would suggest First Allied generates annual rental income of around $68m. At a typical “cap rate” (the % yield used to value the portfolio) of 7.5% (again derived from the REIT peer group), this suggests a gross property value (before debt) around $900m. The term “shopping center” in the US doesn’t refer to indoor malls, but rather to out of town “strip malls”, generally a row (or rows) of shops running alongside a huge car parking area. These shopping centers are generally located by freeways in the sprawling suburbs of the US. US shopping centers frequently have an “anchor tenant”, one very large retailer accounting for a third or more of the square footage of a center. The anchor acts as a draw for the center and this gives it significant power in negotiating with the landlord. The anchor would expect to pay less “base rent” than the other tenants, and may be able to negotiate “percentage rent”, rent based on turnover. The success or failure of the center will be closely linked to the success of the anchor, a good quality anchor (such as a Wal Mart) can make a center, whilst a poor quality anchor will make a center unattractive to potential tenants. 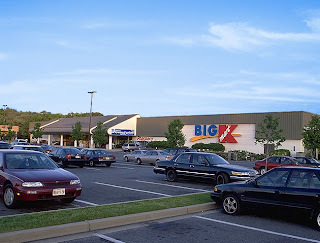 The photo and diagram below show a typical First Allied owned center (this one is in Greenbelt, Maryland with a total retail area of c.140k sq ft and is anchored by a K-Mart). An analysis of the sixty five shopping centers First Allied lists on its website show some interesting facts about the business. Only twenty of the centers have anchor tenants, but these account for 55% of the company’s total square footage. Of those that do have anchor tenants, K-Mart is by the far the largest, with seven stores accounting for 14% of the total portfolio (and 44% of anchor space). K-Mart is not a high quality tenant, a discount retailer founded in 1951 (the same year as Wal Mart), K-Mart’s story is one of years of failure and decline. K-Mart (which is now part of Sears) hasn’t reported a year of “same-store” (that is comparable stores excluding openings and closings) sales growth since 2002. First Allied’s over exposure to K-Mart and under exposure to its competitors Wal Mart (only anchoring one of First Allied’s centers) and Target (anchoring two centers) will not have helped during the sharp consumer downturn of the last two years. The First Allied website shows which of its properties are currently unlet (what are called “voids” in the property sector). First Allied’s overall void rate is just under 9%, which is fairly standard for US strip malls at the moment (again using the REITS peer group as a benchmark). The headline 9% figure disguises a more worrying trend in the 45% of the portfolio that is not anchored by one retailer. The non-anchored centers have a void rate of over 14%, which is very poor by industry standards. Of the 44 non-anchored centers, 14 have 20% of more of their space empty. Void rates around 20% are normally considered to the tipping point at which a center may enter a downward spiral as shoppers are put off by all the empty lots, and more retailers elect to leave the center in the search for better locations. On the positive side, First Allied’s shopping centers tend to be located in above average income areas of the US. The company does not have huge exposure to California or the south west where the residential property crash has had most impact. The biggest geographical exposure by state is to Texas (around a third of total space). Texas has proved relatively resilient during the US recession, and First Allied’s two largest centers in the state are well anchored by Target stores and have low void rates. On balance however, the First Allied portfolio shows signs of significant operational weakness. All US retail real estate companies have found themselves under huge pressure since 2007, but First Allied’s weak anchor mix and very high void rate across its non anchored portfolio suggests that income will have fallen more sharply than the industry average over the last two to three years. What does all this mean for the Glazer family’s finances? Well like all real estate businesses, it is certain that First Allied will be significantly leveraged, both at the corporate level and at the level of individual shopping centers. All First Allied’s quoted peer group have suffered balance sheet problems in the last few years as rents have fallen, capital values have fallen and companies have found debt harder to roll over. In the quoted sector, the REITS have responded to these pressures by raising significant amounts of new equity during 2008 and 2009. The table below shows typical debt to equity ratios in the quoted peer group and the scale of the equity fundraising undertaken. In total, the six REITS have raised $3bn in new equity in the last year, equivalent to around 30% of their existing shareholders’ equity. The vast majority of this new capital has been used to repay existing borrowings. As a private company, the option of issuing new equity to the market is not open to First Allied. Obviously we have no insight into the shape of the company’s balance sheet, but it would not be unreasonable to assume that First Allied has a “typical” real estate capital structure, with debt representing at least half of gross assets. On the $900m of gross assets estimated above, it is therefore likely that First Allied would have at least $450m financed through debt. Given the high void rate experienced by the company and the weak anchors in many centers, cash flow has probably been well below plan for the last two years or more. Whilst purely guesswork, in these circumstances and (unlike the quoted peer group) without having access to external sources of equity, it seems very likely that the Glazers will have had to put capital into First Allied. The need to recapitalise First Allied fits entirely with the family’s management of its other businesses. The Buccaneers have been starved of investment on the playing side, at United no attempt has been made to repay any of the PIK debt (and indeed Red Football has been purposely refinanced in such a way to allow the club’s cash to be used to pay the PIKs). The family’s only quoted investment has been sold, as has a high profile property asset, together bringing in almost $100m. Has this money gone to shore up First Allied’s balance sheet? And what of the loans the family took from United? Are they a reflection of the fact that First Allied no longer has the capacity to pay the family dividends to which no doubt they were accustomed during the property boom years? What does all this mean for United? Well this quick glance at the Glazers’ other interests suggest the family are overstretched and in retrenchment mode. That doesn’t tally with the assertion that the club is “not for sale”…. Perhaps someone should make them an offer. Who's missing from the party?